Have More Likes on Instagram Than Ever Before! One of the most basic steps toward Instagram success is getting Instagram likes. An Instagram strategy will only be deemed successful if it is able to generate a respectable number of likes. However, people often fail to persuade followers to double-tap their posts. This resource will look into 20 of the best ways to get more likes on Instagram. Focus on content quality: A great Instagram post isn’t necessarily the product of an expensive DSLR camera. A modern smartphone is capable of producing astonishing imagery. Nonetheless, Instagram users should only consider posting their best shots if they want to leave a positive impression on their followers and gather a lot of likes. Use filters: Users should try out different filters and see which ones work for their particular content. When used properly, filters add quality to the content and can be decisive when it comes to receiving likes on Instagram. The right filter can perfect any shot and give it a distinguished look that can further entice followers into hitting that like button. Run contests: Create like-to-win contests on Instagram to entice followers to engage with posts. This is an easy way to start getting more likes on Instagram. Users often host contests where the rules are plain and simple – like, tag, or comment on the post in order to be eligible to win a prize. Consistent posting schedule: Posting consistently is a sure way of getting more likes on Instagram. A consistent posting schedule adds a dose of professionalism to any account, appeals to the Instagram algorithm, and also increases the relevancy of the account. Users will know that the account will have new content for them to check on and enjoy. Post user-generated content: User-generated content is content provided by followers. Account holders often incorporate user-generated content into their Instagram marketing strategies because it drastically improves awareness. As more and more users participate, and post this content on their account, it drives interest in the account which started it all. Use Instagram Stories and Live: Both features allow users to increase their chances of attracting more followers. More followers mean more likes on Instagram. 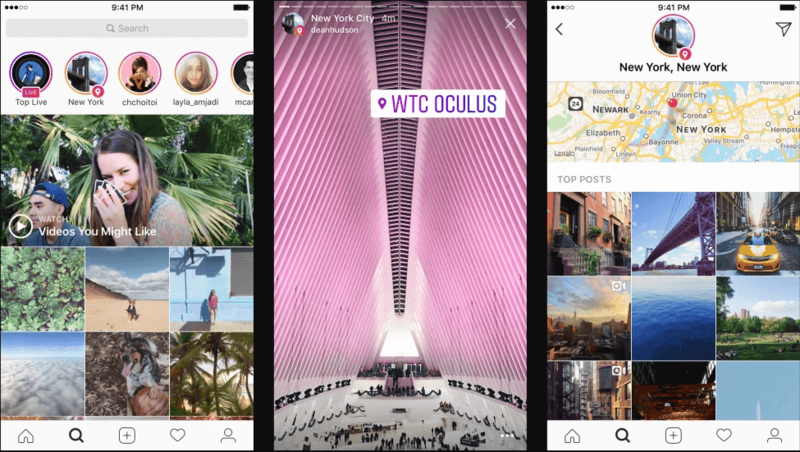 The footage displayed on Instagram Stories is mostly raw and unscripted, giving users a chance to leverage more authentic, genuine content, while participating in viral trends with ease. Make content discoverable: Offering a unique hashtag that followers can use when creating user-generated content directly impacts the exposure of the content. Unique hashtags drive more traffic, increase awareness, and display a sense of professionalism. Unique hashtags additionally ignite user-generated content which results in increased growth in followers and likes. Unique hashtags work best for those who post consistently and frequently because it gives their followers a chance to get familiar with and addicted to the content. Post during peak times: Posting during peak times will allow users to receive the maximum number of likes on their posts. This can be done by analyzing their core audience and doing extensive research on the best time to post on Instagram, or using a tool like CoSchedule. Use calls to action: By encouraging followers to take action in their posts, users can improve their engagement and increase the number of likes they get. Using specific calls to action for more likes is obvious, but also incorporating call to action for comments will help. More engagement breeds more engagement, and it will help you vary your calls to action. Use other social networks: Cross-promotion allows users to increase their reach and invite people who already follow them on Facebook, Twitter, LinkedIn, and more to become a fan of their Instagram content. When done effectively, cross-promotion can generate more exposure to Instagram content, improve brand image, and generally impact the growth of an Instagram account. A next-level step is to create a contest on another platform and make liking a post on Instagram part of entering. Use analytics tools: Analytics tools provide useful statistics that allow users to alter their strategies and maximize their growth on Instagram. These tools allow users to learn more about their audience, measure their success, improve their marketing strategy, plan future campaigns, and divide resources. Utilize hashtags: Hashtags are highly important when it comes to receiving more likes on Instagram. Users turn to trending hashtags, as well as unique hashtags, in order to receive more likes on their posts. In addition, Instagram allows users to follow specific hashtags and have the content for those hashtags appear on their feed. By using hashtags strategically users can increase the exposure of their content and improve the overall reach. Capitalize on trending topics: Posting content that is related to trending topics allows users to leverage its popularity and generate more Instagram likes. However, this doesn’t mean that users need to go out of their way just to tap into popular topics. Focus on searching for trending topics within the account’s niche and exploit that content properly. Optimize captions: A well-written and optimized caption can be crucial when it comes to generating likes on Instagram. Instagrammers use this opportunity to throw in several hashtags and add a brief description in order to receive more likes. The caption should be a reflection of the style of the account. It is a chance for users to establish their voice and unique approach to their content strategies. An optimized Instagram account is a growing Instagram account. Users might not feel the impact immediately, but optimization is a great strategy that shows results in the long run. Users should aim to optimize their entire profile, including their bio, profile name, Instagram Stories, captions, and comments. The algorithm factors in almost every written word on an Instagram account, you need to properly optimize the account in order to get the most likes. Aim to go viral: The content, timing, niche, and hashtags all factor into a viral Instagram strategy. It seems like a simple thing to do, but in most cases it takes a whole lot of luck to succeed at going viral. When users do succeed at going viral, their likes skyrocket. Location tags: Tagging the location of the posts will allow people in the area of the location to see the post. People looking for photos near that location will engage with them, meaning that there is a high chance to receive more likes. Users can also tag their locations on their Instagram Stories. Buy Instagram likes for social proof: Social proof is defined as a psychological phenomenon where people assume the actions of large groups of people represent the right behaviour. Instagram is all about the numbers. People will likely be more interested in a post that has 5000 likes than a one that has 50 simply because the first post has social proof with the massive number of likes. Buying Instagram likes will also increase the chances of attracting more organic followers. Partner with influencers: Partnering with relevant influencers can directly impact the growth of an Instagram account. A quality collaboration with a successful Instagram influencer can help increase the number of followers, and also the number of likes. This is sometimes called an account takeover, and many have succeeded in the past. Form a community: By engaging with followers, asking questions, and interacting with their comments and content, users can form a community and become a pro-active Instagram member. This will directly impact the number of likes they receive on their posts. In addition, users on Instagram are more likely to reciprocate a like or a comment, just because a user liked or commented first. It is the law of Instagram, and it is how Instagram users collaborate. Through community-based interactions, users on Instagram help each other grow. The algorithm: The Instagram algorithm decreases or increases the exposure of Instagram posts depending on their popularity (number of likes) within the first hours after posting. Getting a lot of likes in the first hour after the post is live is very important. Instagram strategy: A respectable number of likes improves online presence, builds brand awareness, and increases leads and conversions. In other words, the more likes an Instagram account averages, the more effective the Instagram strategy. Get featured on Explore: The purpose of the Instagram algorithm is to deliver the best possible content to entice users to stay longer on the platform. The algorithm considers the accumulated number of likes when featuring posts on Explore. The more likes a post gets, the better chances it has on being featured on Explore. It takes more than just creative and unique pictures to become famous on Instagram. By combining quality content with the 20 methods above, users will definitely see a spike in their likes on Instagram. Users craft and alter their strategies according to their own style, but the above-mentioned elements are the foundation of almost every successful Instagram strategy. By focusing on this as a guide, Instagrammers can gradually grow their Instagram accounts and get more likes on Instagram than ever before.